We have created a cartoon character called Mortimer who accompanies the children through their lessons. Mortimer, known as “Morty”, is a boy from the Middle Ages. He has travelled through time to the present due to a magical mistake made by his uncle and teacher Godfrey. His teacher and two best friends, Malcolm the dragon and Betty the bat, have travelled with him and they are all learning about a lot of new things. Children are very enthusiastic about Morty, his friends and their adventures. This is the age where the child’s brain is hardwired for multiple languages! With simple dialogues, activities, songs and beautiful pictures we amaze the little ones.The children will learn over 300 words and many songs and rhymes. At this age, children learn English just as easily as their mother tongue. The children are gently introduced to the language in small groups. Exciting games, songs and teaching materials turn the lessons into an interesting experience. 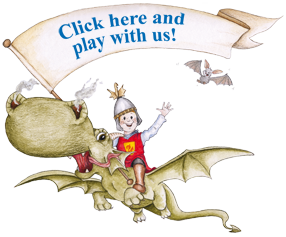 Children aged four and upwards can take part in our “English for Children” courses. Each child is encouraged in a playful manner and in small, age-related groups. First of all, children learn to understand and articulate words and short sentences. Reading, writing and grammar exercises are introduced later. After just a short time, children are able to sing English songs, take part in simple conversations and understand short stories without any problems. Within just one year, children acquire a vocabulary of approximately 500 words and are able to sing 14 English songs.